During New York Fashion Week the schedule can be quite hectic. But between shows and meetings I enjoy trying new hotspots, so I decided to check out Cha Cha Matcha. This adorable and super ‘grammable matcha cafe is nestled in the heart of Nolita on Broome St. Their palm-treed green and pink branding immediately pulled me right in and I couldn’t resist one of their signature hand-whisked matcha drinks. In today’s pictures I’m wearing an amazing purple glitter culotte by Returning Seasons – plus tights to protect me from the cold. I layered it with my go-to Rika Studios dress and a vintage kimono that I bought in Tokyo. During winter season there is nothing I love more than layering. I just love to feel warm, cozy and all bundled up. 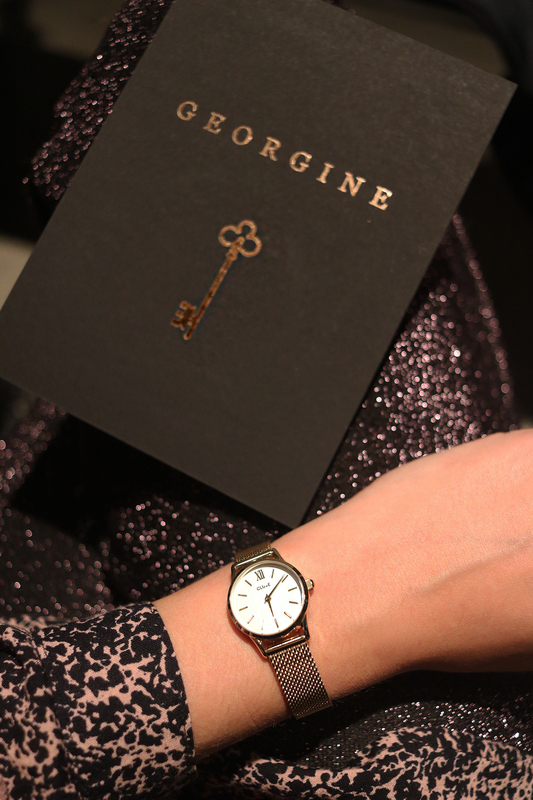 In terms of accessories, I kept it simple by wearing my new La vedette Cluse watch, aviator glasses by Loavies and some of my favorite rings. To make this look all wearable outside I combined it with a white chunky knit scarf by Barts Accessories, a beanie by Goldbergh and my I am studio green coat. 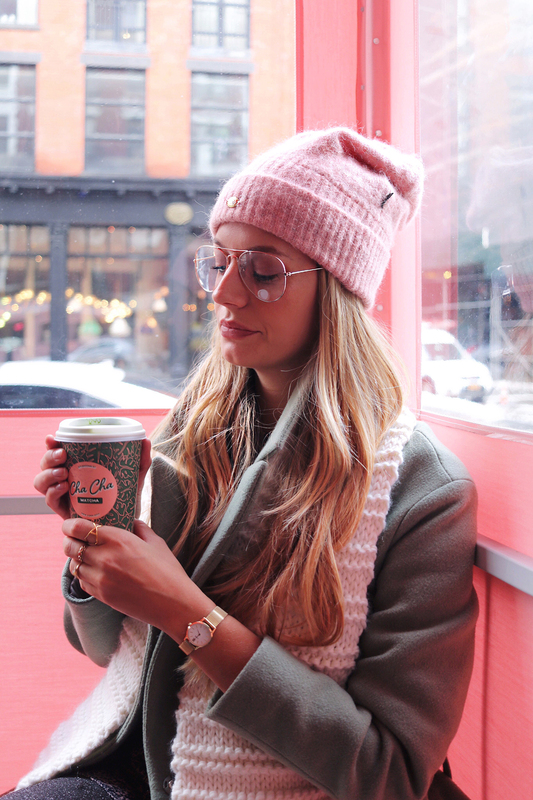 Posted in Fashion, Food, TravelTagged Barts Accessories, Cha Cha Matcha, Chunky knit, Cluse watches, Goldbergh, green coat, I am Studio, New York, NYFW, Pink beanieBookmark the permalink. Your outfit is so chic girl, I love the color of the coat and even how your drink fits as an accessory! I’ve heard so many good things about matcha drinks. I still haven’t tried it yet. Love how your outfit matches the surroundings. I love matcha so this place looks amazing to me. Beautiful watch too. I’m loving that coat, babe! Thanks for sharing and have a great week! You look amazing! I am just dying over this color combo! Happy Monday! Love your outfit and that nice beanie! Thanks for sharing! In love with you’re beanie & glasses ! Enjoy the matcha ❤ and keep going on ! I love these pictures!! ❤ And oh the pink beanie is so cute!! You look stunning Merel!! I will definitely have to visit this place when I’m in New York next! Oh this is great look for fashion week and for fashionable strolling the streets of New York. And thanks for the heads up on this place. I wish I still worked in Soho I could probably walk here! I definitely want to come here when I visit New York next! I love how the colours in your outfit match the Cha Cha decor! 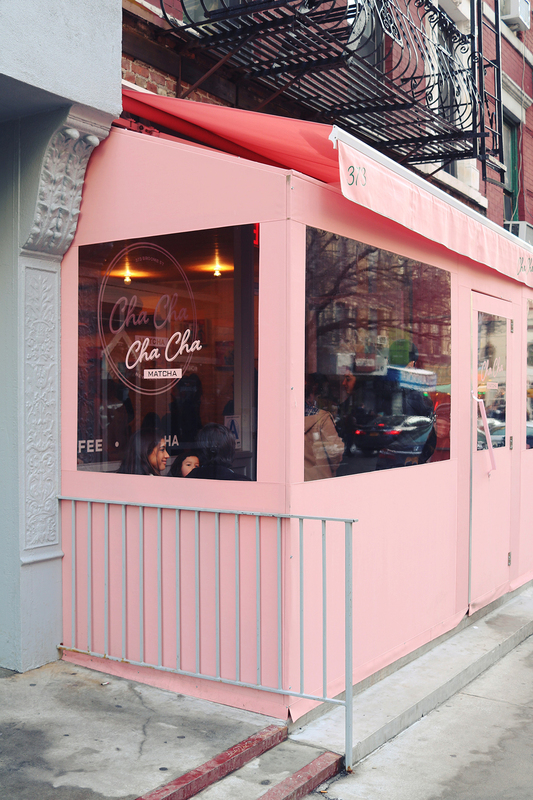 Every time I visit NYC, I always pop by Cha Chat Matcha – its SO good, and very instagram friendly.